Carmen Marc Valvo sheer leaf-print caftan coverup. For in-store inquiries, use sku #2537476. Carmen Marc Valvo bikini swim bottoms in leopard-spotted animal print. Cutout, beaded detail and shirring at side. High-waist style sits below navel. Full seat coverage. Nylon/spandex. Imported. 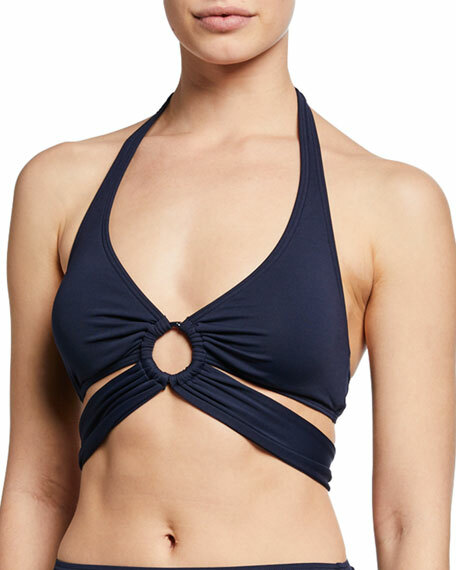 Carmen Marc Valvo solid microfiber bikini top. Halter neckline; center O-ring detail. Draped straps tie at back. Clasps at mid-back. Nylon/spandex. Hand wash. Imported.